Himeji Castle (aka Himeji-jō) is the biggest Samurai castle in Japan, and arguably one of the coolest and most photogenic places in the entire country. This is a huge fortress complex that covers almost 600 acres, stands about 200 feet tall, and has dozens of defensive gates and walls from the medieval period. Himeji Castle can be visited easily on a day trip from nearby places like Kobe, Osaka or Kyoto. The design and history here are incredible and VERY worth a visit even from other parts of Japan. Himeji Castle can be visited easily on a day trip from Osaka or Kyoto. Himeji-jo started construction in the 1300s, and then it was expanded even more in the 1600s by Samurai ruler Toyotomi Hideyoshi. At one time, thousands of soldiers lived in the Himeji-jo complex, and many times throughout history the castle was almost lost. During World War II, Allied bombs were dropped on the castle and failed to explode. It also survived a major earthquake in the 1990s. Today, Himeji-jo is listed as a UNESCO World Heritage site and also a National Treasure of Japan, and it gets about 3 million visitors per year. The castle just went through 5 years of restoration work and it’s finally viewable again without tons of scaffolding on the main keep, so right now is a GREAT time to go see it. The castle grounds are huge and you could spend hours exploring them. The main keep (tenshu) of Himeji Castle has 6 floors. You can go to the very top. Himeji can easily be visited as a day trip from nearby cities like Osaka or Kyoto. I would budget at least a couple of hours for walking around the castle complex and seeing everything here, although we personally explored the castle grounds for almost 4 hours and could have stayed longer. 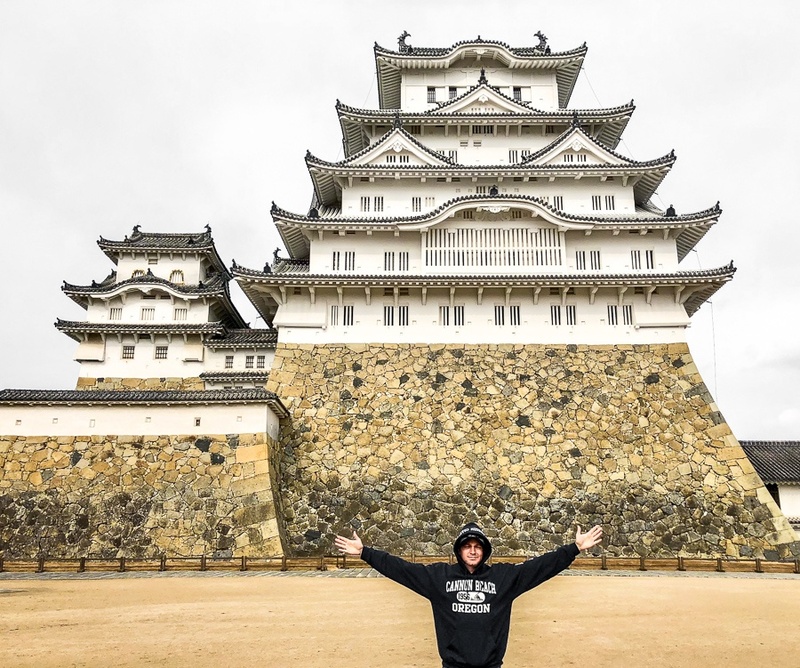 I’ve wanted to see Himeji Castle ever since I was a kid, so when I was passing through Japan recently I knew I had to devote an entire day to the experience. The castle is such a work of art, especially when you view it at a distance. The architecture of the castle is incredible. The castle complex is HUGE and there are a lot of different areas to explore; it’s easy to get lost in, but that’s part of the fun. The main keep has 6 stories and you can climb to the very top and look out through the bow-and-arrow slits for a better view of the surrounding city. There are some great restaurants and gift shops near the castle that are worth checking out as well. See tiny me in this photo? The last allowed entry time is 1 hour before closing. The castle is generally open every day of the year except for December 28 and 29. Tickets cannot be reserved in advance. The entrance fee is 1,000 Yen. There’s no extra charge for going into the main keep. The best way to reach Himeji is by train. Japan has an awesome rail network so this is a pretty smooth process. If the instructions below seem confusing, you can click on the links to bring up the exact routes in Google Maps! No guess work needed. While it’s technically possible to visit Himeji Castle on a day trip from Tokyo, I would not recommend it because you would spend almost 8 hours total in transit and the tickets would be very expensive. The one way journey takes about 3.5 hours and costs ¥15,120 ($133.21 USD). If possible, it’s definitely a better idea to visit Himeji from somewhere closer, like Kyoto or Osaka (info below). Riding trains like this is part of the fun in getting to Himeji Castle! Travel times to Himeji from various cities in Japan. Courtesy of the Himeji-jo JP official website. Shinkansen: Kyoto and Himeji are connected by the Tokaido-Sanyo Shinkansen. The journey from Kyoto Station to Himeji Station will take about 45-60 minutes depending on the train. The one way fare is ¥4,750 ($41.85 USD). JR Special Rapid Train: This train journey from Kyoto Station to Himeji Station will take about 90 minutes. The one way fare is ¥2,270 ($20 USD). Shinkansen: Osaka and Himeji are connected by the Tokaido-Sanyo Shinkansen. The journey from Shin-Osaka Station to Himeji Station will take about 30 minutes. The one way fare is ¥3,220 ($28.37 USD). JR Special Rapid Train: This train journey from Osaka Station to Himeji Station will take about 1 hour. The one way fare is ¥1490 ($13.13 USD). After you exit Himeji Station, the castle entrance will be just a 15 minute walk away. Happy travels! This is one of the signs that greets you as you arrive in Himeji city. The most popular months to visit Himeji Castle are late March to mid-April, with the first week of April being especially busy because of cherry blossom season. Golden Week (first week of May) is also very busy because of the holidays. I personally think the castle is amazing any month of the year, so I say just go when the crowds aren’t around! We went in January and had the whole castle mostly to ourselves. There is no way to reserve tickets in advance, so if you go during peak season you’ll have to be there early in the morning to get tickets. The Himeji Castle official website has a congestion forecast with the expected number of visitors, and they also have this helpful calendar that shows which days of the year are typically busiest.